Spring 2018 marks the 35th National Youth Poll conducted by the Institute of Politics at the Harvard Kennedy School examining the political opinions and civic engagement of young Americans ages 18 to 29. Since its conception by two Harvard undergraduate students in 2000, the Harvard Public Opinion Project has provided the most comprehensive look at the political opinions, voting trends, and views on public service held by young Americans. Beginning on April 10th, 2018 and continuing through the month of April, the IOP will release results from specific portions of the poll. Updated results will be shared on this page. CAMBRIDGE, MA — The Harvard Kennedy School of Government’s Institute of Politics (IOP) today released new results from its 2018 Spring Youth Poll that focus on the issue of immigration. The poll, which surveyed 18- to 29-year olds, found that nearly two-thirds of all young Americans support a specific path to citizenship for the approximately 800,000 young people who are members of the DACA population, also known as Dreamers. Of those polled, 63 percent agreed that a path to citizenship should be provided to the DACA population, while 14 percent of the respondents were opposed to a pathway. On a general level, immigration and refugee-related issues ranked third among the most concerning issues in the minds of likely voters, with 10 percent citing immigration and refugee matters as the most pressing issue. Gun control and Second Amendment issues were listed by 12 percent of likely voters as the most concerning issue, while general matters related to jobs and the economy were listed as the top issue for 13 percent of likely voters. “From the end of 2017 through the first half of 2018, concern over gun related issues and immigration have grown in importance for young Americans. As attention on North Korea settles, young Americans will turn to the White House and Congress, demanding action on both of these issues that often disproportionately impact young people,” said John Della Volpe, Director of Polling at Harvard Kennedy School’s Institute of Politics. Young Americans also believe in the benefits of increased immigration into the United States. A plurality (42%) of likely voters believe recent immigration into the United States has done more good than harm, compared to 30 percent who disagree. A quarter (25%) of likely voters and 35 percent of undecided voters did not have an opinion in either direction. Compared to the 2014 midterm cycle, attitudes of young Americans related to immigration are more favorable. At this time four years ago, 25 percent of 18- to 29- year olds agreed that recent immigration has done more good than harm, compared to 31 percent who disagreed (-6). Among the same general population of those Americans under 30, the Spring 2018 Youth Poll found one-third (33%) in agreement and 29 percent in disagreement (+4). The Harvard IOP poll found that young Americans are strongly opposed to the funding and building of a wall along the U.S. southern border. Among all young Americans, 58 percent opposed the allocation of $9 billion in federal funding for a border wall and other enhanced border security measures, while only 22 percent of respondents stood in support. Of those who opposed the wall, 45 percent strongly opposed its creation. When polling likely voters, the Harvard IOP found that general opposition to a border wall rose to 67 percent, with 57 percent saying they strongly oppose it. Opinions regarding family migration are also clearly formed among young Americans. When asked about the policy of limiting family migration to include only spouses and minor children, 40 percent of respondents opposed reducing the number of qualifying family members. That number rose to 49 percent opposition among likely voters, compared to 33 percent (all respondent and likely voters, alike) who supported limiting family migration to just minor children and spouses. On the subject of merit-based immigration, respondents were generally supportive. Forty-five (45%) percent of all young Americans supported a system that awards points based on factors such as educational level, language fluency, a standing job offer or another connection to the country. Of those polling as generally supportive, however, 27 percent responded as “somewhat supportive,” while only 18 percent answered as “strongly supportive” of the merit system. Meanwhile, opposition to a merit-based system stood at 28 percent among all respondents and rose to 35 percent among likely voters. Twenty-four (24%) percent of all respondents said they did not know how they felt about merit-based immigration policies. Support for this approach was lowest among young blacks/African Americans (32% support) and highest among Asians (64%); among whites, support was 46 percent, it was 41 percent among Hispanics and 57 percent among those of other or mixed races. Among all immigration-related topics, young Americans were most formed in their sentiments regarding Immigration and Customs Enforcement (ICE). Seventy-two (72%) percent of young Americans stated that they only trust ICE to “do the right thing” some of the time (47%) or never (25%); among likely voters, the number was 73 percent. Only 4 percent of all young Americans trusted in ICE to do the right thing all of the time, while more than 6 times that -- 25 percent of all respondents -- said they never trust ICE. CAMBRIDGE, MA – A new national poll of America’s 18- to 29-year-olds by Harvard’s Institute of Politics (IOP), located at the Kennedy School of Government, finds 70 percent of young Americans likely to vote in the upcoming midterms believe that gun control laws in the United States should be more strict. Overall, 64 percent of 18-to 29-year-olds hold this view. This finding represents a 15-point increase from polling conducted by the IOP in 2013, months after the Newtown, Connecticut school shooting when 49 percent of 18- to 29-year-olds supported stricter laws. One-in-ten (10%) 18-to 29-year-olds believe gun laws should be less strict today, while 22 percent think they should be kept the same as they are now. 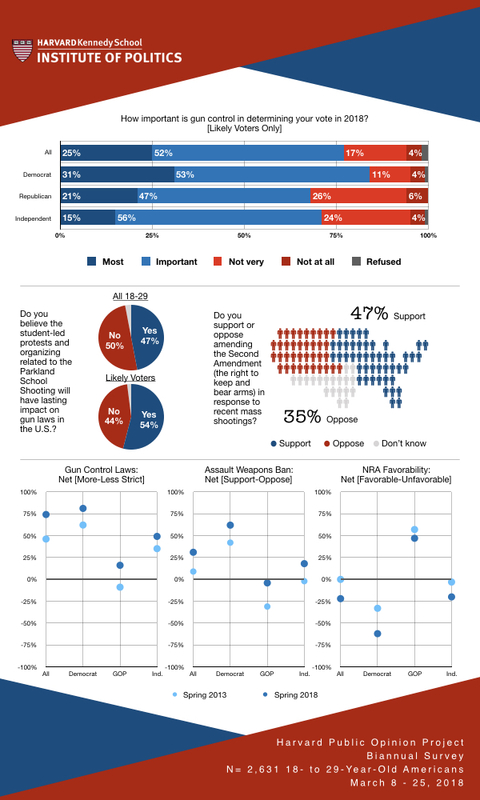 Five years ago, 15 percent preferred that guns laws were less strict, while 36 percent favored keeping things the same. Increased levels of support for more stringent gun laws can be found among young Americans regardless of political affiliation: support increased 16 percentage points among Democrats (69% to 85%), 17 points among Republicans (20% to 37%) and 11 points among Independents (49% to 60%). During the same time frame, Harvard IOP polling also found a 17-point increase in the number of young Americans who support a ban on assault weapons. In 2013, 41 percent of 18- to 29-year-old members of the Millennial generation supported an assault weapon ban, 32 percent opposed it, and 26 percent were unsure. Today, we find that nearly three-in-five (58%) support a ban, while opposition stands at 27 percent, and those who do not have an opinion reduced to 13 percent. Young Americans who are likely midterm voters are significantly more supportive of a ban (67%) than their peers who are less likely to vote (52%). Seventy-six percent (76%) of Democrats support a ban today (+19 since 2013), 43 percent of Republicans (+20 since 2013) and 48 percent of Independents (+10 since 2013). The Harvard IOP poll also found that favorability of the NRA has suffered since the Parkland, Florida shooting. In the IOP's Fall report which was released weeks after the Las Vegas shooting, NRA favorability stood at 34 percent favorable, 40 percent unfavorable. Today, 31 percent of young Americans have a favorable opinion, while 53 percent have an unfavorable view. The number of those who have never heard of the NRA is reduced from 23 percent in the Fall to 16 percent today. NRA favorability was the only gun-related question tracked from Fall 2017 that showed significant, double-digit change. 47% believe that the student-led protests and organizing related to the Parkland School Shooting will have a lasting impact on gun laws in the U.S.
"For several years, the opinions of young Democrats, Republicans and Independents have been steadily shifting toward greater support for gun control measures. We now find a strong majority of 18-to-29 year-olds -- and two-thirds of likely voters -- supporting stricter gun laws and a ban on assault weapons," said IOP Polling Director John Della Volpe. "The difference today is that the Parkland students have created an environment where the lack of progress on reducing gun violence is now symbolic of all the ills plaguing Washington, D.C. The intensity among gun control advocates is palpable, and this is now a lethal issue for incumbents standing for re-election in the fall." You can find toplines for this poll release here. A new national poll of America’s 18- to 29-year-olds by Harvard’s Institute of Politics (IOP), located at the Kennedy School of Government, finds that two-thirds (66%) of young Americans support expanding the use of medical marijuana as a substitute for chronic pain patients who are currently being prescribed opioids. While Democrats (76% support) are significantly more likely than Republicans (53%) and Independents (64%) to support this policy, a majority across all parties support expanding the use of medical marijuana for this purpose. Overall, 12 percent of young Americans (approximately 6.4 million) report that they, a close friend or family member have been affected by the growing opioid crisis in America. Young whites (16%) and Americans living in the Northeast (17%) are the most likely to indicate that they have been affected. Nine percent of young Hispanics, six percent of Blacks and two percent of Asian-Americans say they have been affected. Across the Midwest, South, and West, 11 percent say this crisis has impacted them in a personal way. Opinions related to locating supervised injection sites in their city or town for those addicted to opioids are less formed. The Harvard Public Opinion Project found that 32 percent support the sites, 36 percent oppose them, and 30 percent do not currently have an opinion. A plurality of those affected oppose the sites (44% oppose, 39% support). With approval at 42 percent, Democrats are far more likely to be supportive of this potential policy initiative than Republicans (16% support, 55% oppose) and Independents (32% support, 34% oppose). For one member of the Harvard Public Opinion Project (HPOP), these findings hit home. “My father lives in constant pain. He has been prescribed opioids and I have seen that they can give life to people who experience debilitating pain. Once medical marijuana was legalized, he was able to move to that treatment and I saw him become a healthier, happier person who was able to better manage his pain," said Iris Feldman, a sophomore from San Francisco, CA. “As efforts continue to mitigate overdose mortality and HIV infection, young Americans are about evenly split in their support, opposition, or lack of opinion toward safe injection sites among opioid users. We have a need for further research on these controversial proposals as we move forward in solving the nationwide crisis," said Samuel Zwickel, a freshman from Chippewa Falls, WI who is also a member of HPOP. Read the toplines from this poll here. Preference for Democratic control of Congress has grown between now and the time of the last IOP poll. In Fall 2017, there was a 32-point partisan gap among the most likely young voters, 65 percent preferring Democrats control Congress, with 33 percent favoring Republicans. This poll of N=2,631 18- to 29- year olds, which was organized with undergraduate students from the Harvard Public Opinion Project, was conducted using GfK’s probability-based online sampling methodology between March 8 and March 25, 2018. The margin of error for the poll is +/- 2.54 percentage points at the 95 percent confidence level. Weeks before the Cambridge Analytica story broke about the misuse of Facebook data, Harvard Public Opinion Project students were interested in young Americans views of technology companies engaged in the public realm. Using the same framework that we apply to public institutions and agencies, we find that Amazon and Google are held in relatively high esteem, especially when compared to Uber, Twitter, and Facebook. Overall, 45 percent of 18- to 29- year olds indicated that they trust Amazon, and 44 percent reported that they trust Google, “all” or “most of the time.” Fourteen percent (14%) indicated that they never trust Amazon, and 15 percent said the same about Google. Approximately half as many young Americans indicate that they trust (all or most of the time) Uber, Twitter, and Facebook when compared to Amazon and Google, and nearly a quarter of the population (between 22% and 24%) never trust them. Despite media coverage that might suggest otherwise, college students have largely positive views of their college and university administrations, and few partisan differences emerge. Overall, 61 percent of college students report trusting their administration all or most of the time, which places colleges and universities ahead of the U.S. military (51% trust all or most of the rime, -1 since Spring 2017), the Department of Justice (45%), the Supreme Court (43%, -3) and the FBI (42%), among public institutions. Similar to last year’s results, Congress (17% trust all or most of the time, -3 since Spring 2017), the media (16%, even since Spring 2017), and Wall Street (-12, even since Spring 2017) are the least trusted institutions that were measured. Click here to download the top lines results. Click here for a set of graphics and data visualizations. Throughout the month of April, we will be releasing additional details and poll results on topics including: gun control, the 2nd Amendment, and the NRA; the border wall, DACA, and immigration policy; sexual harassment, assault, and the #MeToo movement; use of and interest in joining the U.S. military; the opioid crisis; and public service and community service.